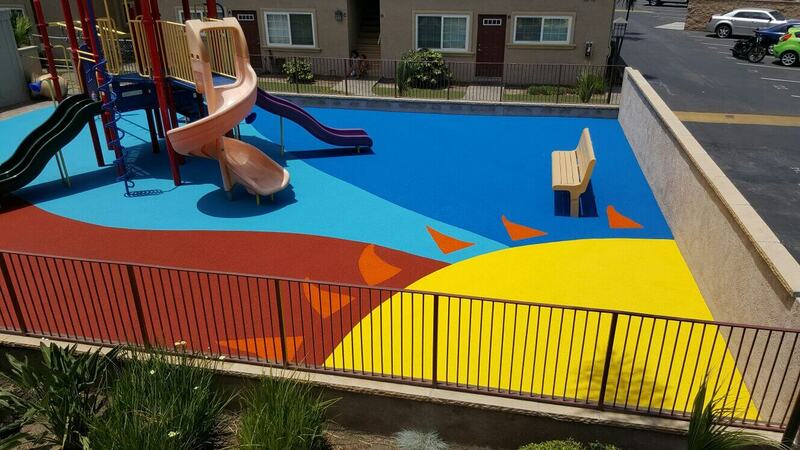 No Fault offers poured rubber safety surfacing for playgrounds, splash pads, pool decks, baseball fields, walking and jogging tracks. We can also provide rubber tiles, bonded, loose-fill rubber mulch, and synthetic play turf. Images shown may depict a product feature or design without fully reflecting the product overall. Please refer to product details and specifications when making a final selection for purchase. Repair kits are available for safety surfaces that show signs of aging and use where the color cap has been separated from the shock absorbing black mat. If you need a repair kit, you may contact our Production Department by calling 225-293-7760, or emailing Kevin Hunter at kevin@nofault.com or Ben Machia at ben@nofault.com. Please have the following information readily available when discussing repairs. and instructions to complete your repair. This is enough material to cover approximately 12-15 square feet of surface area at ½” cap depth. You will need a container for mixing the binder and rubber, and a trowel or putty knife to apply the mixture. For repairs larger than 12-15 square feet, we offer material orders of rubber in 50 lb. bags and polyurethane binder in pails up to 5 gallons. If you believe your repairs may require the attention of our installers, please contact us. Regarding repair work to your surface, pictures really are worth 1000 words in helping us understand how to best resolve your concerns.